Do you want to head into the New Year on a healthier note? Are you already concerned about the effects of Christmas treats? 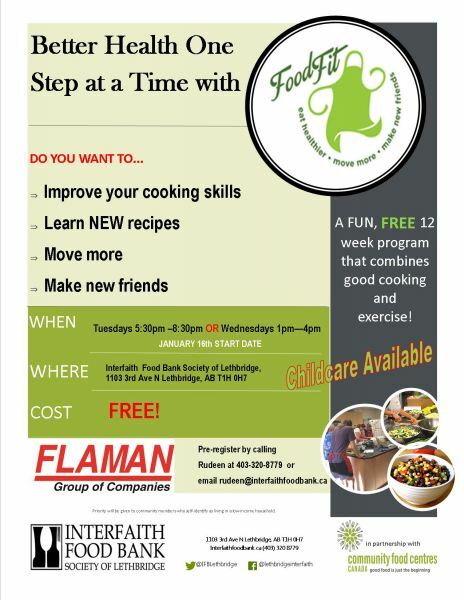 Join FoodFit classes to learn about nutrition, cooking, and exercise and start 2018 with a healthy bang! Spaces are now available for the next round of FREE classes, childcare is available for some sessions. FoodFit brings community members together to set goals, learn skills, and make measurable changes in overall health and fitness. The goal of the FoodFit program is to support community members to become better nourished, more active, and less socially isolated. Over 12 weeks, participants cook, learn about nutrition, and participate in physical activity. Our next round of classes begin in January 2018 on Tuesday Evenings 5:30 – 8:30pm or Wednesday Afternoons 1:00 – 4:00pm. We are also seeking volunteers to assist with this program. To register, to volunteer, or for more information call Rudeen at 403 320 8779.